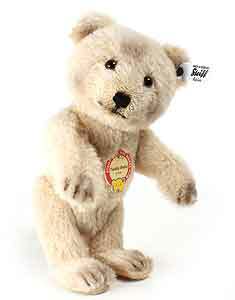 1929 Teddy Baby Replica by Steiff. 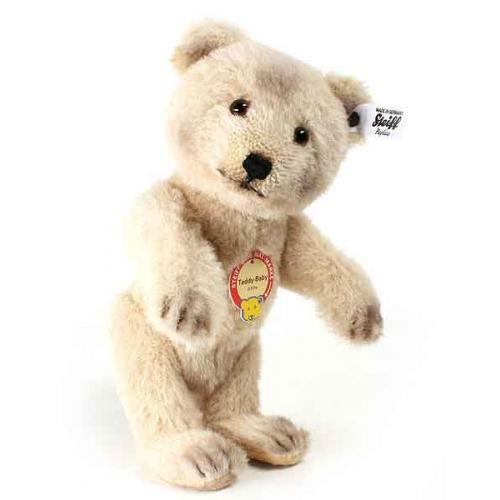 This beautiful hand made piece, in alpaca wool, is fully jointed and wears the white ear tag, signifying this item as a Steiff limited edition, together with the replica, underscored patinated steel, Button in Ear from 1929. His soft alpaca wool fur, is a soft grey/beige with airbrushing around his face, paws and feet, to age him slightly. His nose, mouth and claws on his feet and paws are embroidered in black thread. His glass eyes are brown with black pupils. 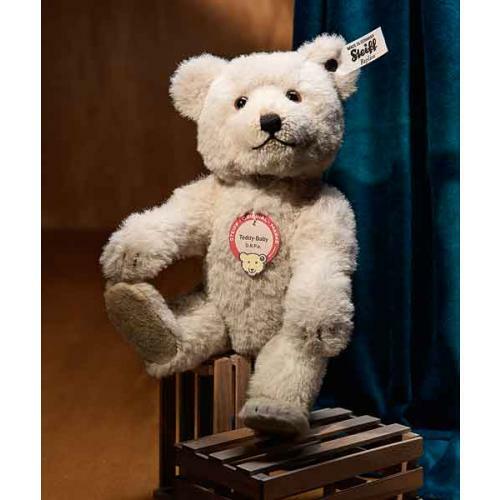 His Wool Felt paws and flat feet pads are a very pale apricot colour and again they are airbrushed to age him. Limited Edition of 929 pieces worldwide. Ashby Bears proudly present TEDDY BABY REPLICA 1929. Richard Steiff wanted to have a bear with “the most vivacious smiling expression.” A year later, in 1929, this bear type was registered for a patent: cute, with a new design and characteristic head shape, in four variations and with the annotation ”Teddy-Baby D R P.a” (“German Empire Patent Pending"). 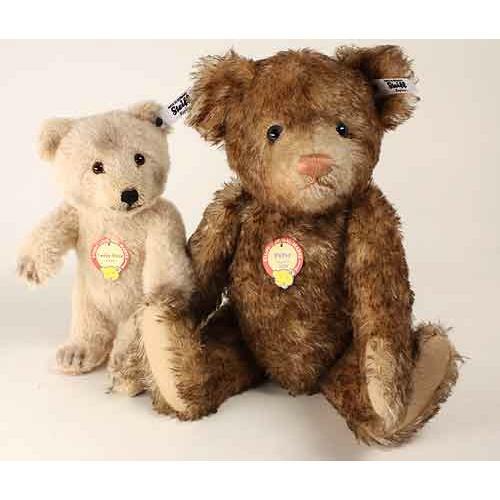 However, Teddy-Baby was not patented – and therefore received the “Teddy-Baby trademark” in October 1930. He was still a great success. Teddy Baby replica 1929 is corn coloured with a squeaker is a replica for which a patent was applied for. It is made of Alpaca, stuffed with excelsior, has felt paw pads and the tag “Teddy-Baby D.R.P.a. ".